Dominion Resources Inc. is in the business of energy, and it wants a name change to reflect that. To recognize its focus on energy and to unify its brand following last year’s merger with Questar Corp., the company rolled out a new proposed name and coporate logo Monday, Dominion Energy Inc., that CEO and Chairman Thomas F. Farrell II says is a truer representation of the company than its current moniker. 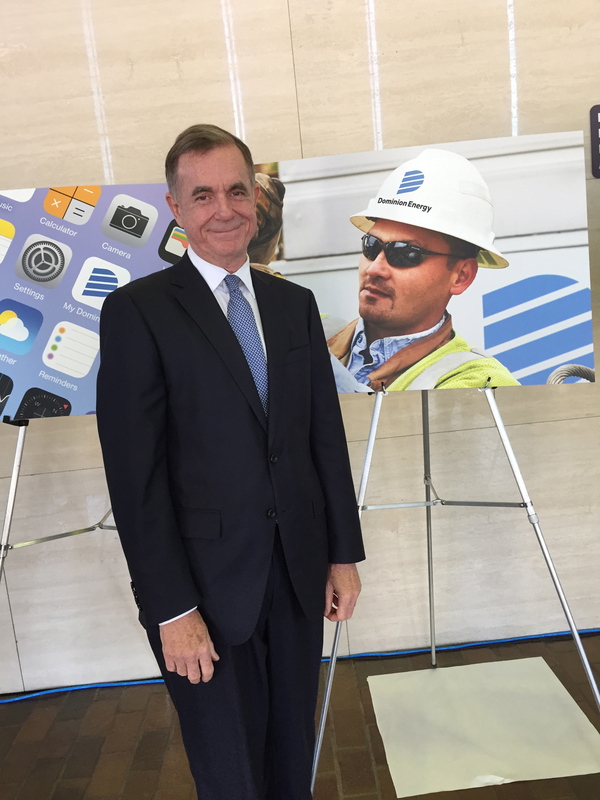 Dominion Energy builds upon the company’s 119-year-history, Farrell said, and “updates our company’s look and unifies the company’s brand across all of our lines of business and throughout the 18 states where we do business,” he told a small audience that gathered at the company’s corporate headquarters building in downtown Richmond for the announcement. The new logo retains Dominion’s dominant “D” shape while updating it with stripes suggesting energy through a blue background that customers already are familiar with. Dominion Resources was created in 1983 as a holding company for its electric and natural gas utilities, a services company and another subsidiary. The current logo, showing a finger on a light switch against a blue background, was introduced just prior to the merger with Consolidated Natural Gas in 2000. “ Apparently, 17 years is a long time in logo land,” said Farrell. The global branding firm of Chermayeff & Geismar & Haviv designed the new logo. The New York-based graphic design firm is behind some of the world’s most recognized trademarks, including NBC, State Farm and National Geographic. Sagi Haviv, a partner and designer, said after doing some research it became clear to the firm that Dominion’s logo “should be updated not reinvented.” That’s because he said the Dominion brand has two things every company wants: “The public has a positive perception of the company,” Haviv said, and it had a well-established brand with the capital “D” on a blue background. If shareholders approve the name change, the company would begin replacing logos on everything from employee hard hats to company vehicles and buildings. It also will need to change its official name for doing business in seven states -- Idaho, North Carolina, Ohio, Utah, Virginia West Virginia and Wyoming – where its gas and electric distribution companies reside. The company’s new principal operating units – Power Delivery Group, Power Generation Group and Gas Infrastructure Group – would replace Dominion Virginia Power, Dominion Generation and Dominion Energy, respectively. Asked how much the rebranding effort would cost, Farrell described it as “not a significant amount,” for a company of Dominion’s size. He said the cost would be at the shareholders’ expense and and not passed through to consumers. Dominion is the state's largest utility. It's also one of the nation's largest producers and transporters of energy, with a portfolio of about 26,400 megawatts of generation, 14,600 miles of natural gas transmission, gathering and storage pipeline and 6,600 miles of electric transmission lines.